Booking The Mac Twins will cause a storm at your special event! As a booking agent for The Mac Twins we can arrange for them to DJ for your guests. Identical twins Lisa and Alana Macfarlane (aka The Mac Twins) are one of the UK’s hottest young DJ duos. 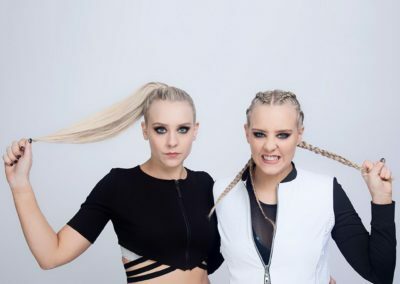 Whether its interviewing some of the world’s biggest stars or DJing live at the UK’s top events, the last couple of years has marked the Mac Twins as rising stars of their generation. The Mac Twins’ big break was presenting for Verge Magazine, with whom they covered some of the biggest music events including Wireless Festival and Radio 1′s Big Weekend, they were also flown out to Tennessee with Plan B to record a documentary for Jack Daniels. They have since been seen and heard on BBC Radio 1xtra (weekly slot), Daybreak, 4od, the Alan Titchmarsh show and BBC free speech. 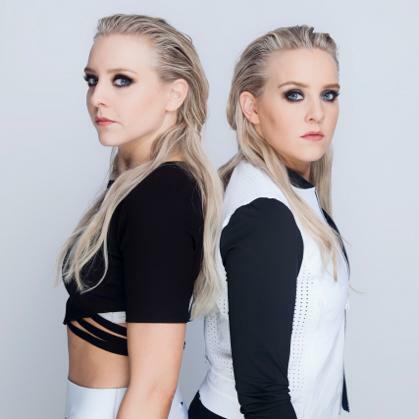 The Mac Twins have hosted events such as ‘Musicalize’ at London O2 and most recently Emerging Icons and the Ents Forum Awards with Radio 1’s Huw Stephens. In September they opened Sunset Festival’s main stage and this month will be hosting Festifeel at House of Vans alongside Fearne Cotton, introducing acts such as Mike Skinner and Slaves. Last year saw a sell out run of The Mac Twins chat show Mac Yourself at Home at the Edinburgh Fringe, where they had the fringe’s biggest stars like Russell Kane and Joel Dommett on the sofa for a natter. This year they brought their groundbreaking immersive Club Night Play to the Festival and played to almost 10,000 people and were showcased as one of the top acts of the Fringe. The girls have a natural passion for music and DJ at many events and clubs across the UK. The Mac Twins have had residencies at two of London’s most exclusive clubs, Whisky Mist and the W Hotel, a DJ spot at the Olympics and a summer residency at the super exclusive ‘Lotus Club’ Marrakesh, Morocco. The Mac Twins have since played all over the UK at clubs and universities, opened up monthly ‘Pop Shop’ at Bloomsbury Bowling Lanes, provided the soundtrack to art gallery openings and for brands such as Tia Maria and Diet Coke and this year playing everywhere from the Strictly Come Dancing Tour to sell out crowds in Belgium (whilst still finding time every month for their residency at Scotland’s nightclub of the year WhyNot). The Mac Twins always attract big names to their sets they have DJ’d for the likes of Liam Gallagher, Kelly Brooke, One Direction, Ed Sheeran, Holly Willoughby and Tinchy Stryder. The Mac Twins also have regular columns in both the Huffington Post, Standard Issue and the Evening News. Contraband is the UK’s top booking agent, with friendly, knowledgeable account managers who guarantee you the best deal possible. Contact us today if you would like to book The Mac Twins to be the headline of your event! We as your booking agent are more than happy to help you create the most memorable moments with The Mac Twins.